LMAO Karma its a b1tch she has asked if she can deliver my injection from horseback in a sort of sick one sided joust....I am having some serious concerns about this woman. All sets in place added 2 KGS to all lifts,back work felt ridiculously light on all lifts which is a good sign.Bicep work also felt light apart from reverse cables I fear there is not much shuffle room on these LOL. Another one under the belt and tbh I could have repeated it straight through again I am over the moon with my recovery.I reckon the years of battering the sh1t out of my body through stupidity has helped in rapid repair. All sounding positive buddy and a nice steady increase each week is ideal. Feeling better every week it was a bit depressing to see how far back I have gone,but now just loving being able to get back in amongst it forgot how much I love training . I think it was my third pin ever but as I pulled the needle out, it was like the frikken exorcist! Blood spurting out everywhere, covered me , all over the white sheets and it just kept coming ! Very traumatic! Full sets once again,weights again felt light on a good few exercises especially on upright rows well under par on these ,still sticking to the slight increase though it just feels right. Side pulls were starting to give a bit of a niggle in my left knee corrected it by putting more weight onto the right not ideal but it worked out OK .Its never been right since the op but any sideways movement has always been a problem,should really wear a support on it so I think its a good idea to invest in one now. Don't pinch the flab as that creates pressure in the area. I give the target area a wipe, take a breath and jab it in (same strategy as with my missus). I keep the needle in for ten seconds then put my finger over the "hole" and give it a rub (that the bit she loves the most). We’ve all been there ! And these things to help massively to prevent further injuries. The good thing is as you get stronger, you start not needing them as much, especially if you’re not max lifting. I haven’t used my wrist wraps in the last 6 months. I couldn’t imagine a time when that would be the case! Best jab technique is using the Z track method. Pull your skin away taught , put the needle in straight and jab and then release the skin. This seals the med in the muscle and the only thing that might come out is a tiny bit from the length of a needle.. the angel of gains share! She has asked if she can deliver my injection from horseback in a sort of sick one sided joust....I am having some serious concerns about this woman. Good work mate sounding stronger day by day! He does almost put you off, doesn't he! Must have nicked a vein or something. Did you not aspirate? Awesome tip with the z track mate! LOL at the strapped to hell pic, Like you say I would rather strap it now and prevent anything serious later on,its just you think FFS the weights are p1ss and I am getting niggles already. Brett cheers mate,I am really surprised at the way its going tbh ,the sessions are feeling far to easy which is ramping up my confidence no end. Rad if you are doing SubQ then you are doing it in the tummy aren't you? 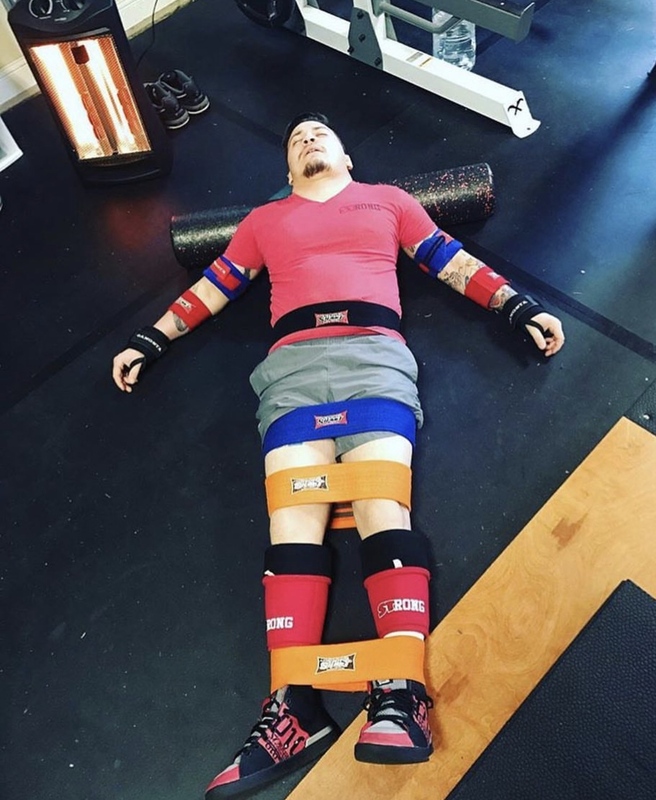 Glutes aren't really necessary for TRT and the Z-track method that Animal posted would be a lot harder to do by yourself when doing glute injections. Yeah Hom3r shots to the belly it seems for its the best place for trt something to do with the fat letting it slowly disperse better so not getting spikes also the slower breakdown supposedly helps keep estrogen in check and could help lower levels.Can really only see if this is right. Woke up this morning eyes swollen,throat swollen,insides shaking,anxiety ,skin like sand and that flu like feeling where your bones feel cold.Thought fcukin hell that thing is back again started to pick up in the afternoon but no where near good enough to train so just left it. We had a liver and bacon casserole last night which was bloody lovely the Mrs had made a gravy with Worcester sauce turns out this contains gluten and soy and it triggered all this off again in a really bad way. Feeling a bit better now just going to have to be really careful at the minute and stick to the basics unreal how hyper sensitive my body has become. Yeh you need to be so careful with gluten. It’s everywhere! Liver and bacon tho! Fook yes! I hope the liver was still pink, none of this old boot style ? ! Be careful with belly jabs. My wife is type one diabetic and she jabbed insulin Subq in belly for 10 years and she has some hard lump deposits which are almost impossible to get rid of. She’s got an automatic pump now but because subq is so close to top layer it can cause these so change sites often.. Anywhere where there is fat is game. I’m also a bit skeptics about the estrogen thing but could be wrong. Males carry majority of their fat on belly and side of chest (women in arse and hips) and these high fat deposit areas are also caused by high esto? Do you have any links I can read mate? I’m looking to try sub q eventually when I cruise. Thanks for the heads up on belly shots because I am going to be on this for life any info is greatly appreciated it might be a idea to rotate between belly and glutes.Although glute shots will be my Mrs dept which is worrying to say the least a menopausal women with a sharp object doesn't sound good LOL. All I come up with after a lot of research is to split your dose to e3d or e4d so 100mgs a week would be 50mgs e3d this supposedly gives a steady supply and not spike your levels thus driving up estrogen plus subq is also a better way to avoid test spikes,so both combined should theoretically help on the estrogen side of things and stop the need for a AI.